Dell is a private company that makes laptop and desktop computers and computer accessories. It was formed in 1984. It is named after Michael Dell, the CEO and creator of the company. 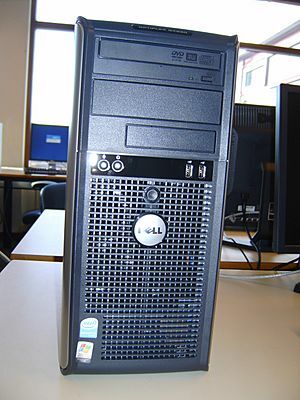 Dell makes computers for businesses and home users, and they also make computer monitors and Printers. They used to make portable music players, called the Dell DJ, and PDAs too. Their company is in Round Rock, Texas. In 2006, they employed over 78,000 people. Some of their computers have a Linux operating system. Others come with Microsoft Windows. Dell Latitude E5570, a 2016 model. Dell Facts for Kids. Kiddle Encyclopedia.